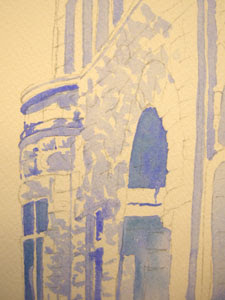 Now I am using two blue paints to develop the initial values: French Ultramarine Blue and Prussian Blue. Using my value chart (see the entry two days ago for more on Value Charts), I try to locate the dark values from number 4 through number 6. 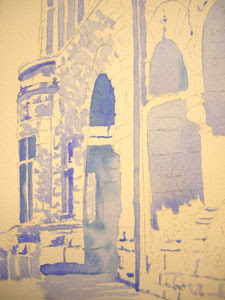 I use these blue pigments to begin to build the values. I work very wet, use simple, light brushwork, and I try to avoid brushing in the same area with more than one stroke. If I need to add more color I allow it to dry first.